This heated build stage seeks to make 3D printing with the MakerBot a little easier. When hot ABS or PLA meet the cold, cruel world they have a tendency to warp. This was concern for [Devlin Thyne] when he was developing our Hackaday badges. What you see above is 10 Ohm nichrome embedded in clear silicone, then sandwiched in between two plates of glass. 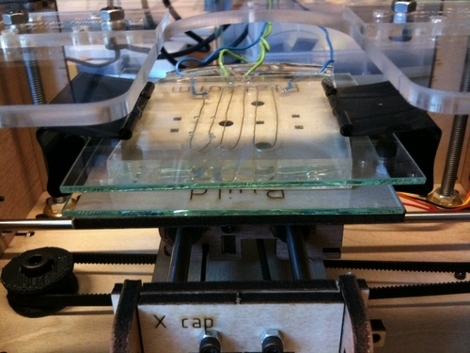 The device is made to interface with the MakerBot and includes a thermister for temperature sensing. With a small firmware upgrade you can now set the build stage temperature which should make larger printed objects a bit easier to deal with. A while back we saw a hotbed for the RepRap, but this implementation should be cheaper and easier for the smaller MakerBot applications. ← Polaroid instant film, reborn. they sell little heating pads at pet stores (little smaller than a sheet of copy paper) for only $7. PLA doesn’t suffer from warping. It’s ABS and HDPE that warp significantly. Also, maybe there should be a seperate ‘3D prototyping’ folder to file this under, rather than ‘CNC hacks’. They’re quite distinct fields of interest these days. Hydraraptor’s been making heated beds that attach to the print surface with magnets. This way you can easily remove the print by flexing it, without having to pry it off with a razor, which is hard on the kapton tape. was thinking about doing this with the whole area = heating it all up, not just the table. Do any of these prototype in wax? Just wondering since it would really nice to use for casting.